The glass stickers include some adult themd stickers, they are packed in a black envelope with words "Adult Only" signed on it. So if you don't like it, just take them out from normal glass stickers. 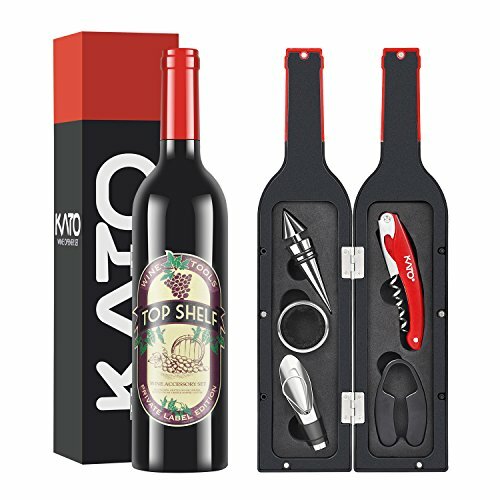 GREAT WINE LOVER GIFT - All the 5pcs premium wine accessory set in the Festival & Creative wine bottle shaped box and a static cling reusable drink markers sticker set make this wine accessory set an excellent gift for Father's Day, Thanksgiving Day, housewarming, birthday, holiday, wedding or anniversary. WINE OPENER SET (5 pcs) - Includes: 1pc multi-functional hippocampus knife, 1pc wine stopper, 1pc foil cutter, 1pc aerator pourer, 1pc drip ring all displayed in a wine bottle shaped gift box. 3 STYLE, 36 PCS WINE GLASS MARKERS - This wine accessory set come with a static cling reusable drink markers set, Stickers are an ideal way to personalize your guests their wine glasses. Easy to use. Never drink from the wrong wineglass again!